These stocks can go much higher in this rising market! As we look at the market’s landscape, we see a lot to like going forward. First off, the late-December bottom brought some historic oversold readings when looking at the number of stocks hitting new lows. And then, on the way up, we saw a rare “blastoff” indicator flash (which usually portends great gains for the next six to 12 months) and the intermediate-term trend had turned up. Bottom line: Now’s a good time to look for new leadership. The five stocks below are a good place to start. Start growing your wealth today! We invite you to join us on the path to becoming a better, more confident, richer investor by downloading your free report, Cabot’s 5 Best Stocks to Buy in February, and signing up for our free investing advisory, Wall Street’s Best Daily. 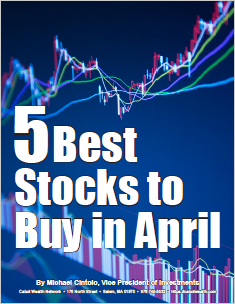 Get the names of the best stocks to buy today in this FREE Report, 5 Best Stocks to Buy in April and start making more money now.